Building on the popular Pinhey Quartet, it was our pleasure to once again collaborate with Larco Homes on another urban infill project in the Hintonburg area. 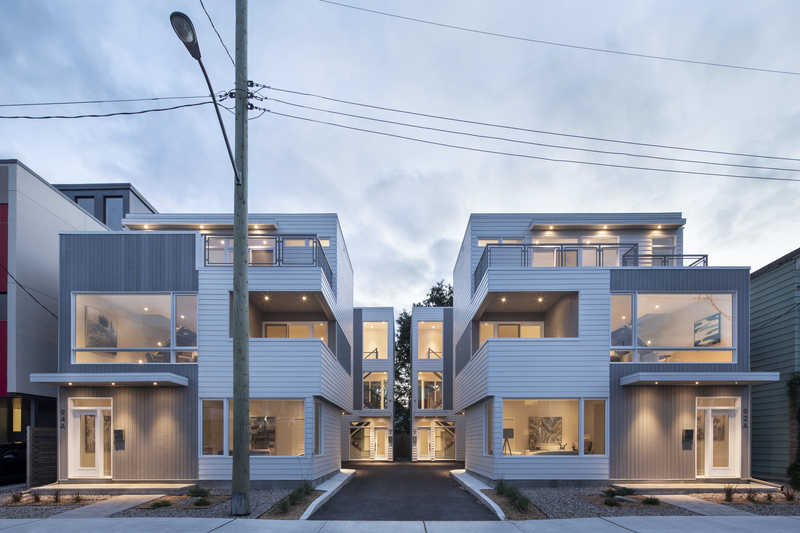 Similar in scheme to the Pinhey Quartet, the Pinhey Infill maintains a four unit aggregation while responding to changes in site and neighbouring context. 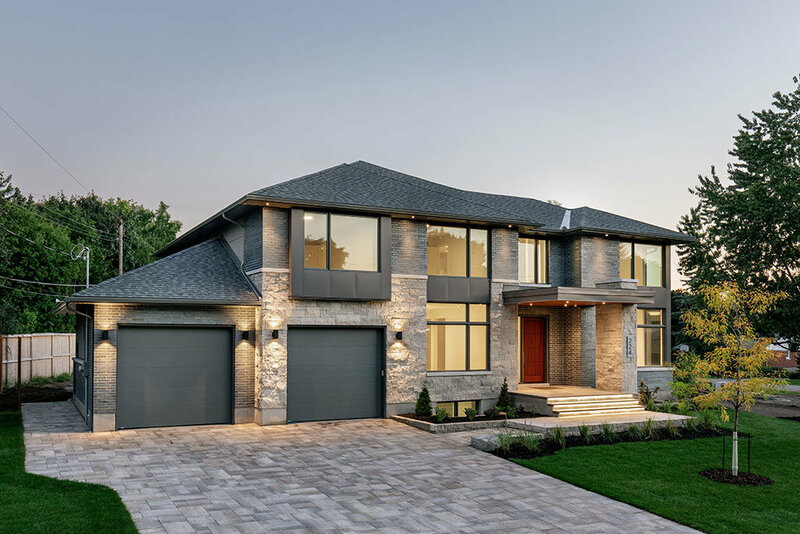 While modern in design, the use of white plank and grey cedar on the exterior and the covered porches ensure the homes complement the surrounding context; both in scale and aesthetic. The tonal material palette accentuates the massing and lets the architecture speak for itself. Crestview was designed for comfort-minded homeowners who care about issues of sustainability and environmental responsibility. See photos. From the curb, the home sits comfortably and respectfully amidst its neighbours, yet is unassumingly contemporary in its tonal palette and clean articulation. Inside, finishes are balanced; light, airy surfaces capture large volumes of space and brightness on the one hand, while richer, stately accents of hardwood and stone anchor the home’s focal areas. 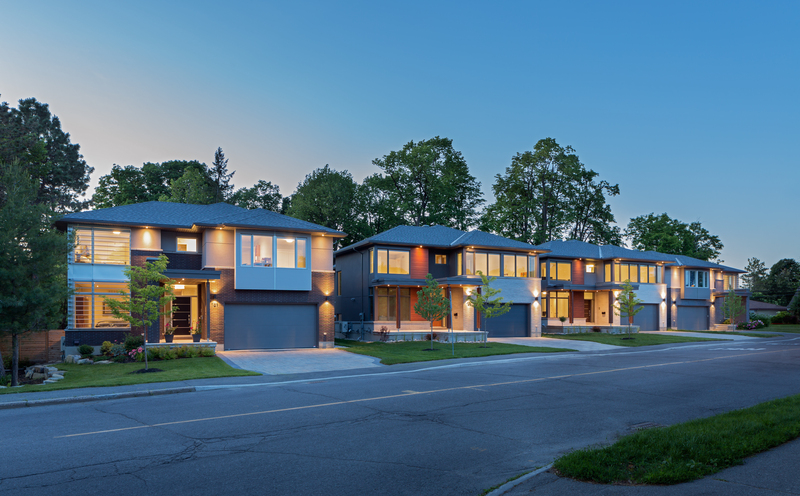 Alongside its good design sense, Crestview is an exactingly built Net Zero Ready Home. Its features are exhaustive, rigorously selected for both sustainability and user comfort: Home automation, heated floors, triple glazed windows, airtight drywall system, added insulation thicknesses, high-performance HVAC. These measures combine to provide the home exceptional airtightness and an Energuide rating of 92. Riverpark Green “The Meadow” with RND Construction: Detached Homes – Production | 2,501-3,000 sq.ft. “The Meadow” is part of a unique enclave of four single family homes located in Riverside Park South. The design elements are broadly appealing, intended to entice a range of families needing a home that supports flexible lifestyles. The open plan features an accessible “away room” on the main floor and four bedrooms on the second level. This R2000 certified production home appeals to homeowners’ aesthetic and pragmatic senses; the home combines energy efficient construction with visually appealing design.